Spend 5 minutes (or any allotted amount of time) each morning with Jesus before your kids go off to school or before you rush off to work to simply read Gods word and pray. On Sunday I blogged about our summer that was relentlessly brutal. I had mentioned that I felt as if I was failing in encouraging them, showing them Jesus and not praying blessings over their hearts, souls and minds. As I continued to wrestle with the hurt I knew I could do something significant about this part of my chaos. I could break the cycle and change. This morning I started anew. 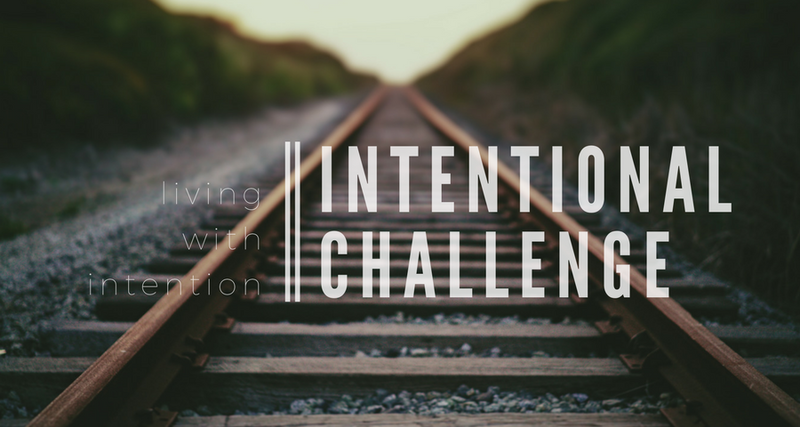 I started a simple challenge on being intentional. Being intentional about this lacking. As my kiddos began their first day of school, we added to our morning routine. I told them all that I needed 5 minutes of their morning. That's all. 5 minutes. Being intentional is what I want to drive me this year. I believe it has purpose. It has value. It is worth it. As I processed why we should be living intentionally, my head reminded my heart why we need to be intentional. 1. To encourage one another. Hebrews 10:24-25 | 1 Thessalonians 4:18 Encouragement. Something we forget to give to others, but always remember that we need. To encourage is to praise someone. To support someone. To boost the confidence of someone. To lift up someone. To endorse someone. What if we were able to do this for others? What if we were able to teach those around us to do this for others? I recently read a read this post by Jen Hatmaker. What if we found the strengths of everyone around us and boosted their spirits? What if we sought to see the amazing, instead of focusing on short comings? Would it make a difference? Today, I did what Jen did. I pulled out my chalk board and am finding a place in the house to display it so that we can begin to encourage instead of tear down. Focusing on the positive. 2. To be kind and compassionate to one another. Ephesians 4:32 | Proverbs 3:3 Be kind and compassionate. Show empathy and mercy for those who you come into contact with each day. Walk alongside of those you love deeply and those you have just met. Being kind and compassionate partners so well with encouragement. It really is the tender side of encouragement. Come alongside. Walking next to them. Teaching them. Guiding them. Sitting with them. Showing that you are simply there for them without judgement. Sitting in silence can often be uncomfortable or awkward because we tend to want to fill the silence, but sometimes we need to come along side graciously, with humility to show compassion simply with our presence. Often I encourage moms to correct their children in 25 words or less. After 25 words we have likely lost their attention. The same goes with showing kindness and compassion. The less words we use, the more action they see, the more supported and loved someone feels. Should that not be the point of kindness and compassion? Simply loving those that we come in contact with each moment of the day. 3. To build up one another. 1 Thessalonians 5:11 Growing up I would go to work with my dad when he would check on the job sites that his company was building. I remember hoping out of his car and running off to explore while he would walk into meetings. One of the things that often struck me was the organized chaos of the framing process. Boards supporting one another. Strengthening walls to that held up floors that would eventually house families. Our job is much like the organized chaos of framing. We are called to build up one another. Support one another. We must actively participate in the lives of people. We must intentionally build up each other to show them Jesus. To show them our love for one another. 4. To serve one another. Galatians 5:13 "For you were called to freedom, brothers. Only do not use your freedom as an opportunity for the flesh, but through love serve one another." I am guilt of serving for the sake of being seen. For my own glorification. For getting a pat on the back. However, true service comes from humility. To simply want to love someone enough to serve them well. I have a friend who is so good at this. She is wonderful at coming alongside and serving others out of humility, grace and love. I deeply admire her genuine heart of service. Serving comes with practice. I think the actions are easy, but our hearts are clouded. We must check our heart and soul to find that balance of serving with grace, humility and compassion. 5. To simply be present and enjoy right now. Isaiah 43:18-19 | Proverbs 13:22 Do not miss what God is doing in your life. Despite the circumstance that you may be walking through, you do not want to miss what God is doing in your life, how he is refining you and changing you. It is beautiful. Even if this is a difficult season. It is beautiful. To see that, you need to be present, to "perceive it" (Isaiah 43:19). "A happy heart is good medicine". Being present in the moment creates happiness. Raises your energy. Creates a happy more contented attitude. Who can't use a little more of that? One of the recent vegan detox challenges I took part in taught me a lot, but one thing really stuck out to me. I believe that in this journey in living intentionally we need to focus on progress over perfection. I am sure this week I will NOT be intentional with those that are around me. That I will lose focus on being encouraging. That I will forget my call to show kindness and compassion. That I will fail to build up and support my children in their week. Serving selfishly or not serving at all. I know I will forget to remain in the "right now" and will worry about "what's next". It is inevitable. BUT I know that I can focus on progress over perfection. Can you?